Check out our rustic Yellowstone Rustic Aspen Log Furniture bedroom set from Woodland Creek’s! The Yellowstone line is one of our most unique collections of aspen log furniture. Each distinctive piece of furniture is a naturally created as a work of art, handcrafted with pride and craftsmanship, by master builders, to last a lifetime. We keep the natural look of the wood by using a low sheen catalyzed lacquer finish. From aspen beds, chests, dressers, and nightstands, you'll find all your rustic bedroom needs in our Yellowstone collection. Heirloom quality rustic furniture is made of wood that’s hand picked… and handcrafted. The Yellowstone log furniture line is just one example of the beautiful results Woodland Creek’s master craftsmen strive for. We start by hand picking dead standing, naturally seasoned wood with stunning natural variations (ex: cracks, beetle holes, knots). We then hand peel and handcraft it into fine heirloom grade bedroom furniture that lasts from one generation to the next. Each piece features your choice of a clear catalyzed lacquer finish or a honey finish. Both of which will seal and protect your rustic aspen log furniture for many years to come. 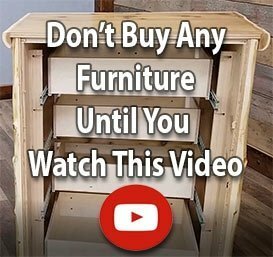 Because each piece of furniture is unique, no two will be completely identical.